This past week, Knott’s Berry Farm hosted a special event for its Season Passholders, lifting the veil and shedding light on every aspect of Scary Farm 2016 that fans can look forward to experiencing very soon! Hosted by the always-exuberant Jeff Tucker, the Knott’s Scary Farm event was pure spectacle from beginning to end, starting with the massive Charles M. Schulz Theatre filling with fog before monsters of all shapes and sizes crept into the audience, snarling and lunging at excited guests and members of the media. A soundtrack of Scary Farm music from years and mazes past played loudly as some 2,000 fans – some who had waited more than 10 hours to be first in line – spilled into the theatre. Once everyone was in, lightning flashed, thunder boomed, and the show began. Long-time Theme Park Adventure fans will no doubt recall our love of a home haunter by the name of Sam Kellman. Not only is Sam extremely focused and motivated, incredibly driven, professional, highly creative, very articulate, and a perfectionist to the very last detail when it comes to creating haunted attractions – he won’t be graduating high school until 2020. He’s a teen haunter with just as much passion and operational sense as anyone we’ve ever met in this industry, and Sam’s just getting started! Actually, that’s not entirely true… Sam has been producing haunts for years; since 2011, to be exact. In short, Sam started doing this at an unusually young age – and he’s absolutely grabbed our attention. This is a comprehensive listing of haunts throughout Southern California. It features theme park/attractions, stand-alone events, and home haunts. If you own a haunt that should be included on this list, please contact us at TPAComments@gmail.com. 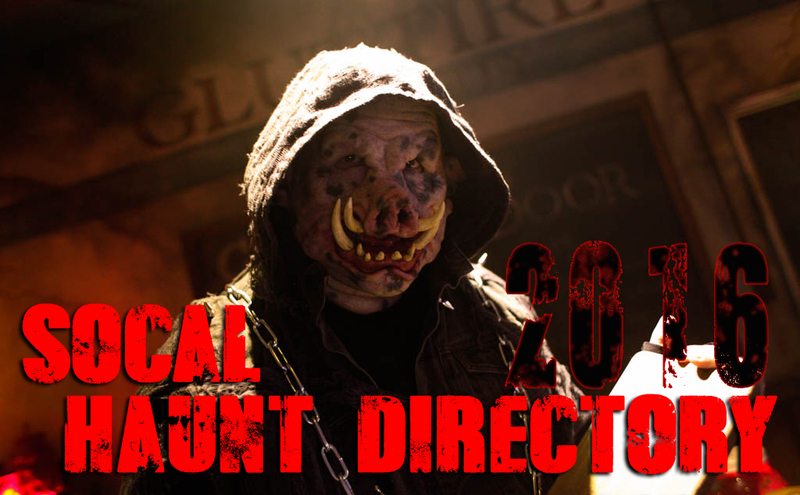 To be included in our 2016 SoCal Haunt Directory, a haunt must have a website/fan page and a physical address. We will continue to update this page throughout the Halloween 2016 season, so it is never too late to contact us. If your favorite haunt is not on this list, they either have not updated their information for 2016, or may not be returning this season. When visiting these haunts, be sure to tell them you found them on Theme Park Adventure!